Over the previous years, I have helped prepare meals for the homeless people in Ishikawacho as part of a service activity. With more than 800 meals being prepared, homelessness and hunger is a genuine issue in the community. In order to act upon this issue, I have participated in the Chiku Service group as I considered this the most ‘direct’ and hands-on way to tackle the issue. Rather than raising awareness or advocating the issue, I wanted to do something that would have a direct impact, hence I chose to volunteer in this service activity. Whether it was during the morning sessions or the lunch sessions, I felt that I was always able to create a positive impact both for myself and the community there. During the sessions, I found that there was often a shortage in volunteers and thus I had to help according to the situation. Thus, sometimes I would be helping to distribute the meals, but when I realized that other processes were not running efficiently, I would switch and help out in those necessary areas. Although this was a challenge in the sense that I had to constantly be aware of my surroundings and monitor other processes as well, I enjoyed these experiences as I was able to interact with others and learn more about them. Although I had to wake up early for some mornings or miss class during other times, I felt that this volunteering experience was a crucial experience for me. Overall, I think that I was involved in this activity for 5 sessions, and it was a really beneficial activity for both me and the community around me. I believe that the development of ATL skills are just as important as the academic grades. These skills can be applied in daily situations as well as the future. Although I have not developed all of these skills to my greatest extent, I believe that I am proficient in many areas- such areas include my research, communication, and thinking skills. My research skills have greatly developed over the past years in the sense that I am now able to access relevant information faster and more accurately. I have learned to digest information from a range of sources while effectively checking to see if these sources are unbiased and credible. Finally, I have learnt to present my work through different platforms that are most appropriate for each project. For instance, in Individuals and Societies, I have practised researching from a mixed range of media sources such as videos, articles, charts, maps, and diagrams. I have realized that each of these media types require specific skills to comprehend and therefore I have developed these skills such as literary analysis or symbolism. In addition, ever since I was taught the CRAAP method (evaluating a source based on its currency, relevance, authority, accuracy, and purpose), I have been able to evaluate the credibility of sources as well as distinguishing fact from opinion. I am now also able to present my work in different ways because of the varying projects I have completed in the past. I have learned that some methods such as videos and presentations are more engaging at times, while posters and diagrams are easier and faster to understand in other circumstances. With this in mind, my research skills are proficient in the fact that I am able to select the most appropriate form of presentation. Another class where my research skills are evident is in Science. Primarily, I have to use a variety of sources during science class- this includes the use of graphs, data charts, models, and diagrams. I have learnt to use and understand these mediums and I am able to comprehend the benefits and limitations that each possesses. Hence, I often make appropriate decisions on selecting the right medium to use to convey my information in an easy and simple manner. In terms of my thinking skills, I have developed in this area through the subject of English. Over the previous years, I have learnt to think critically when analyzing a text or evaluating a source. I have learnt of several methods such as visual and literary techniques to convey a certain theme or message. Moreover, I was able to apply my creative thinking skills when producing a text based on my personal opinion. I constantly thought of new ways in which I could express a certain point, such as when I had to recreate a scene in “Romeo and Juliet” in grade 9. Rather than writing in the form of a story or acting it out, I decided to try something new and write in a newspaper format. This was the result of my creative thinking- something that I would not usually think of doing. In addition, I have been able to use my thinking skills when in Music class. I often apply my critical thinking skills when analyzing or “breaking” down a piece. This helps me to not only identify the composer’s choices but also their intentions when creating the piece. Similarly, I have practiced using my creative thinking skills mainly when composing or performing. For instance, rather than playing the same phrase when I solo each time, I constantly think about trying new techniques when playing on my instrument to establish an interesting sound or tone. In addition, I often use rare and uncommon instruments in my compositions to discover new sounds and to further enhance my creative mindset. Thus, over the previous years, I have developed my approaches to learning (ATL) skills to enhance not only my learning, but myself as a person as well. In the third unit of Spanish this year, I think that I learned a lot on the topic of travel and vacations. I gained new knowledge of vocabulary, expressions, and verb conjugations. 1. What are 7 ways what you learned is like Harry Potter, Star Wars, or another movie of your choice? My learning in Spanish is like the James Bond Movies. 3. How is what you have learned relevant to other classes/material you are learning? The things that I have learned in Spanish are relevant to other subjects in multiple ways. For instance, I have learned about the preterite conjugation in Spanish, which can be applied to any subject in order to have correct grammar and inform the reader of the time and place context that the text is in. Furthermore, the fact that we learned about Spanish-speaking countries can be tied into the subject of I&S, to show or understand why certain countries speak French, especially because of colonization reasons. 9. Make a wordle or mind map of your learning. I demonstrated research skills in the subject of science. In the class of science, I was able to successfully gather a series of information from multiple sources in order to provide accurate facts and figures for my assignments. In addition, I have learnt how to improved my use of keywords, which has helped me to narrow down search results and access relevant answers. Social skills are abilities that I have demonstrated in most subjects. I believe that I have shown these skills most effectively in the classes of music and physical education (PE). In music, my group and I have worked on constructing a song from scratch. I have consistently collaborated with my group members in order to create different roles for different instruments to play. I have discussed and actively engaged in conversations which has helped to improve and make changes to the final piece. In PE, I have interacted with classmates in order to discuss strategies and tactics to help win games as a team. Furthermore, I have communicated with my teammates on the handball court to give advice and help. In addition, I have worked with my teammates to use the attacking/defensive principles of play in matches. I have shown the communication skill in drama, english, and art. In drama, I have communicated not just verbally but also throughout the use of facial expressions and body language. Moreover, I used the elements of drama in order to convey a simple message or a story in unit 1. In unit 2, I used my body stance and positioning to show my character for the Commedia d’ell arte. For english, I have effectively shown communication skills throughout my writing samples. I have conveyed a story in my creative writing prompt and analysed the message and symbols in the novel “Skellig” by David Almond in unit 1. I was able to communicate my personal interests and tastes in art throughout the construction of multiple pots. I created a coil pot and a pinch pot and designed them according to my interests and hobbies. I showed a variety of thinking skills in the subjects of design and individuals and societies. In design, I demonstrated both creative thinking skills and critical thinking skills. I used creative thinking skills when I was generating ideas for my animation, while I used critical thinking skills to analyse whether these ideas would be realistic and/or easy to make. For Individuals & Societies, I used critical thinking skills in order to analyse and compare the development of different nations and the impacts of each nation during the data for development unit. I transferred my previous knowledge to make connections and bonds between information from unit 1 to unit 2. In the subject of Spanish, I think that I am performing a good job of self-management. I have been able to stay on top of my homework and manage all of my papers in my binder. I have found the time to study new words and revise the phrases/expressions that I learnt in class. However, I still need to improve on my self-management skills for math. Although I have been able to complete my homework on time, I still need to find time to revise and study my notes so that I can feel more confident during tests. Goal 1 For next semester, I would like to start being more productive and organised by prioritizing my homework. I will check the due date for each homework assignment and start on the assignment that has the closest due date, which will help me to finish the task on time. Goal 2 I would like to manage my time and use it effectively next semester. I have not been achieving the grades that I have wanted this semester due to amounts of homework and assignments. By spending time on revising, practicing, and looking over my notes, I will be able to score better on my tests and assessments. Goal 3 Finally, I would like to take neater notes. Since some of my notes were disorganised and untidy this semester, I was not able to read my own notes and lost key information as a result. Thus, I would like to focus on creating organised, neat notes for next semester in order to be successful when I revise my notes. During the expedition week in October, I faced a wide variety of challenges in an unfamiliar environment in Minkami, Gunma. This trip has undoubtedly expanded my comfort zone, as I experienced a range of activities, including canyoning, rafting, rock-climbing, geo-caching, mountain biking, as well as multiple team building activities. In this expedition, I got out of my comfort zone when I performed mountain biking, rock climbing, and canyoning. Mountain biking got me out of my comfort zone, as I rode a bike with a different braking system as well as a different type of suspension system. 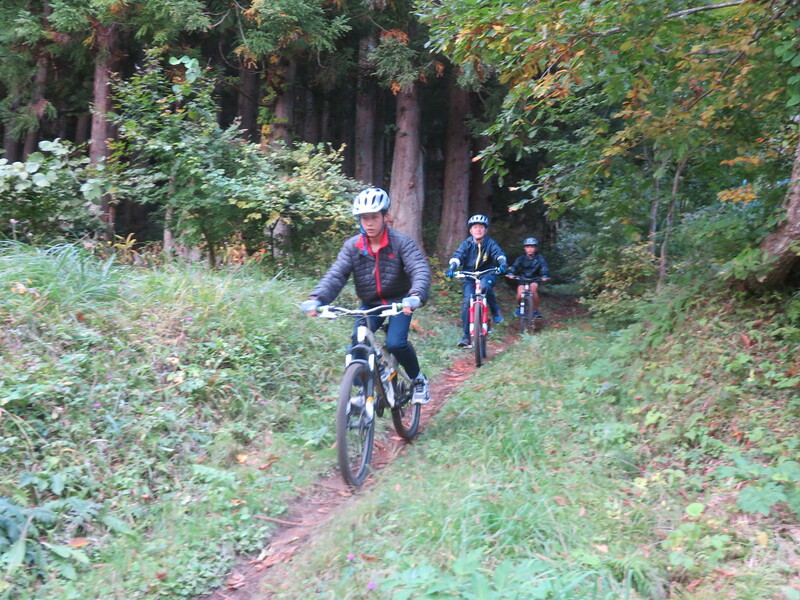 In addition, I rode on steep courses in the mountains, as well as extreme hairpins, which was a new experience for me. Even though I had lots of fun and was able to manage the courses, the experience was challenging and indefinitely got me out of my comfort zone. In terms of reading, I think that I am capable of understanding words that are unfamiliar by using context clues in order to make sense of the word or expression. I think that I am able to understand basic sentence and paragraph structures which helps me to comprehend the text effectively. However, I still make mistakes and errors when I am answering the reading comprehension questions. Therefore, I think that I should make sure that I reread the text twice in order to minimalise my mistakes. My Goal for Reading: Reread the text and read carefully not to miss out on any important details or facts. I think that my writing skills have the most areas of improvement. I am able to write with some flow and accuracy, however, I am not that confident in terms of verb conjugation and the spelling of some words. In addition, I think that I should use more terms and expressions from the unit in order to apply my learning in a piece of writing and familiarize the verb. Thus, in order to decrease the number of errors in my writing, I will make sure to create flashcards on Quizlet and try to memorize as much terms and expressions from the unit vocabulary in order to be able to use it in my writing. My Goal for Writing: Use Quizlet more often to memorize key terms and expressions from the unit, as well learn the correct spelling and conjugation of some words. In the area of speaking, I think that I am making a consistent progress, which is allowing me to speak with accuracy and fluency. This allows me to hold a conversation with others and understand the context. I think that I can work on using more expressions and vocabulary from the unit (again) in order to really comprehend what I am learning and apply it to my speaking skills. Lastly, in terms of listening, I am confident in my listening skills, however I make mistakes from time to time when I do not understand a word and therefore try to spell the word and spell it with an error or errors. IN order to improve on my listening skills, I will listen or watch some Spanish videos in order to get familiar with the accents and flow of the SPanish language. My Goal for Listening: Watch/Listen to Spanish videos in order to familiarize the SPanish accents and different vocabularies.